Kilauea is one of the most active volcanoes on the planet, but many others in America are being monitored. Mount Rainier. Mount St. Helens. Yellowstone. From the outside, they’re majestic summits, picturesque peaks that are among America’s most recognizable landmarks. But inside, these sleeping giants are volcanoes that could, in theory, blow at any time — though early-warning systems would likely prevent casualties. There are more than 160 active volcanoes in the United States, according to the U.S. Geological Survey (USGS). Whether any will erupt soon, like Kilauea did in Hawaii on Thursday, is hard to tell until a few days or weeks in advance. Experts know that certain volcanoes, such as ones in Alaska, erupt often: sometimes multiple times per year. Since they're in remote areas, they don't usually don't pose a threat to the public, though they can cause disruptions to the aviation routes above them. Volcanoes in more populous areas — like the ones in the Cascade Mountains that weave through northern California, Oregon and Washington — pose much less of a threat. "The time scale of eruptions is long compared to most humans' experience," said Chuck Connor, a volcanologist at the University of South Florida. In some cases, that means centuries, or even thousands of years, between eruptions. Mount Rainier in Washington, for example, last erupted about 1,100 years ago, according to the USGS. Hawaii's Kilauea, on the other hand, is considered one of the most active volcanoes on the planet. It's been erupting nearly constantly since 1983. Most other volcanoes fall somewhere in between. Here’s a primer on volcanoes, plus a map of some of the major active volcanoes in America. Volcanoes are vents that spew lava, rocks, and steam out to the Earth's surface. Molten rock below the Earth's surface is called magma. After it erupts and comes out the volcano, it's called lava. Volcanoes usually form at the boundary between the Earth's tectonic plates, which is why in America, they're mostly concentrated in the West, Hawaii, and Alaska. "The eastern part of the United States is basically geologically stable and quiet, and the western part is colliding and sliding past the Pacific plates, and that causes the activity," Connor said. and lava domes, which are technically lava flows that are too thick to flow away from the vent. Lava domes can be sizable: The Novarupta Dome that formed during the 1912 eruption of Katmai volcano in Alaska was 800 feet across and 200 feet high. How much warning is there before an eruption? Scientists are able to predict volcanic activity anywhere from several days to several weeks before it happens — if they have the right tools in place. The USGS currently considers 169 volcanoes in the U.S. to be active, and has in-ground measuring tools to monitor even the slightest change in activity in about half of them — those considered the highest-risk volcanoes, said Charles Mandeville, program coordinator for the USGS volcano hazards program. Mandeville added that in the coming months, the USGS plans to revise the number of active volcanoes in the U.S. down to 161. The 88 currently being monitored the most closely show little activity this week, other than at Kilauea, and the Cleveland volcano in Alaska's remote Aleutian islands, which is under advisory, he said. These instruments were not available before the 1980 eruption of Mount St. Helens in Washington. That eruption killed 57 people and blew ash across a dozen states. Since then, there have been small eruptions at Mount St. Helens. But nothing, scientists added, that should scare anyone away from the area. "I don’t think there’s going to be a major eruption like what happened in 1980 anytime soon. But these [volcanoes] are all considered active. They will erupt in the future, we just don’t know when," said David Williams, associate research professor in the school of earth and space exploration at Arizona State University. So how nervous should we be about volcanoes? Volcanoes pose a significant threat, not only from eruptions, but also from other activity, like landslides. While there's not usually any definitive pattern to volcanic activity, scientists have learned a lot since the deadly 1980 Mount St. Helens eruption — and their tools have become a lot more sophisticated since then, meaning anyone who might be affected should be notified in plenty of time to get to safety. 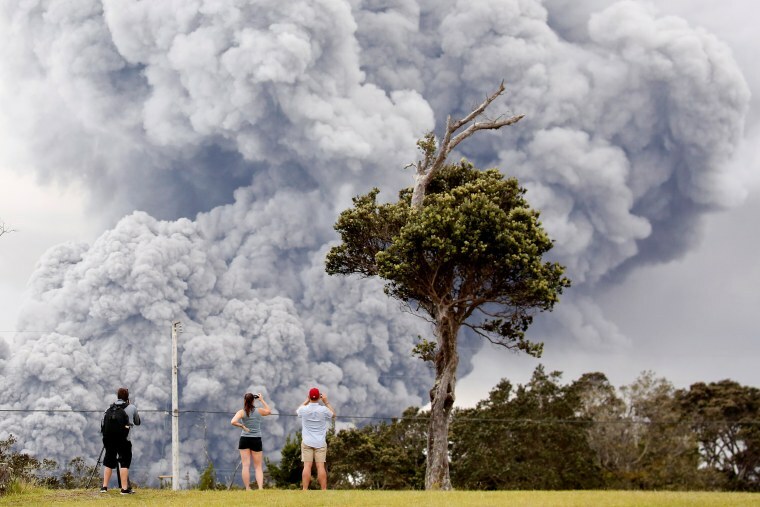 "We’re actually getting pretty good at forecasting the volcanic eruptions," Connor said.